The following information was taken from Wikipedia. Wortwell is a village and civil parish in the English county of Norfolk and adjoining the county of Suffolk. It is located on both the River Waveney (which forms the county boundary) and the A143 road, some 20 km east of Diss and 30 km west of Lowestoft. The city of Norwich lies approximately 30 km to the north. The village name originates from roughly 1704 when naturally occurring 'Wort' was found to spring from a well fed by a water source near to the local river Waveney. 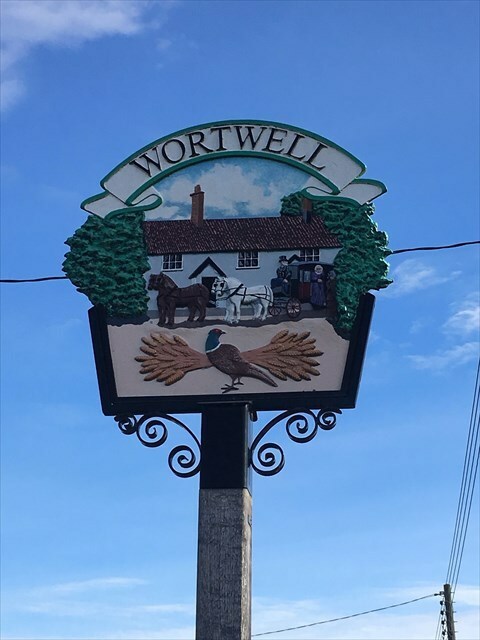 When the local brewer was satisfied with the beer brewed from the 'Wortwell' he would ring a bell to let the local residents know it was ready for drinking, which also gave the local drinking establishment its name, established as a pub in 1836. The civil parish has an area of 4.6 km2 (1.8 sq mi) and in the 2001 census had a population of 574 in 243 households, the population decreasing to 561 at the 2011 census. For the purposes of local government, the parish falls within the district of South Norfolk. The village of Wortwell is one of the few in Norfolk not to be listed in the Domesday Book. Until the end of the 19th century Wortwell was a hamlet within the parish of Mendham-in-Norfolk, (the modern village of Mendham is south of the River Waveney in Suffolk) becoming a parish in the 1885 boundary alterations. At the posted co-ordinates you will find the Village sign. There is plenty of parking off the main road nearby. Look at the sign closely you will find an 11 digit telephone number for Harry Stebbing. Convert these digits to the first 11 letters of the alphabet and solve the equations below to find the cache which is located a short walk away. The cache can be found at the following co-ordinates.